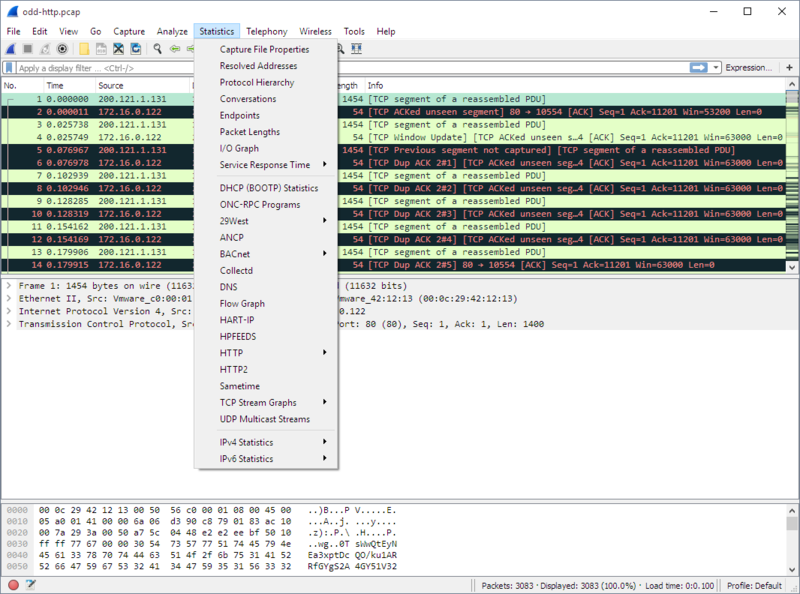 The Wireshark Statistics menu contains the fields shown in Table 3.9, “Statistics menu items”. All menu items will bring up a new window showing specific statistical information. Show information about the capture file, see Section 8.2, “The “Capture File Properties” Window”. Display a hierarchical tree of protocol statistics, see Section 8.4, “The “Protocol Hierarchy” Window”. Display a list of conversations (traffic between two endpoints), see Section 8.5.1, “The “Conversations” Window”. Display a list of endpoints (traffic to/from an address), see Section 8.6.1, “The “Endpoints” Window”. Display user specified graphs (e.g. the number of packets in the course of time), see Section 8.8, “The “I/O Graph” Window”. Display the time between a request and the corresponding response, see Section 8.9, “Service Response Time”.